If It Fits It Ships! I might be adding more books to the list, so be sure to check back regularly! Enter your name in the Rafflecopter below! My favorite book for this year is Deity. Hmm I'd have to say my favorite book of 2012 is Wings of the Wicked by Courtney Allison Moulton! I really loved Time Between Us. I think that was my favorite so far! My favorite books I loved is the Vampire Academy Series. Oh how I love the setting and characters! My favorite book that I read in 2012 is Forbidden by Tabitha Suzuma. She did such an excellent job with the characters and the way she handled the topic! Stealing Parker by Miranda Kenneally!! Well, actually there are some others but not 2012 released ones. I only read it in 2012. For 2012 I think my favorite book would have to Pandemonium. I've loved so many books this year! Maybe Pushing the Limits by Katie McGarry or Insurgent by Veronica Roth... or possibly Under the Never Sky by Veronica Rossi! My favourite so far would have to be Cinder By Marissa Meyer. Wow. So many great books. Thank you for this giveaway! I think Insurgent by Veronica Roth. There are so many books I enjoyed in 2012....probably my favourite is Hunger Games by Suzanne Collins!!! My favorite book of this year is Insurgent by Veronica Roth. I love this book. like Mariki.. my favourite one was Hunger Games! So many good books though! It#s awfully hard naming just one, but let's try ... Sisters Red by Jackson Pearce! My favorite book of 2012 would have to be Crash by Nicole Williams. I don't think I could choose a favorite. I have read a lot of really awesome books this year. Hmmmm Shift by M.R. Merrick, Pandemonium by Lauren Oliver, Pushing the Limits by Katie McGarry, Exhale by Kendall Grey, all of Jennifer L. Armentrout's books that have come out this year including her adult books. Lol!!! Hi Evie! Great giveaway, so generous. It's hard to remember all of the great books of this year, but the first that comes to mind is Rootless by Chris Howard. I absolutely loved that one. Oh, I loved My Life Next Door by Huntley Fitzpatrick too. So good. My favorite books of 2012 is the Elemental Assassins series. Picked them up for a read-along and haven't been able to put them down! I loved, loved, loved Grave Mercy! Pandemonium or the Fault In Our Stars! my favorite book this year so far is Nevermore by Kelly Creigh. What I did for a duke by Julie Anne Long. My favorite book I read this year had to be Beautiful Disaster. my favorite YA book is Bitter Blood by Rachel Caine. First 3 books from the Song of the Fire and Ice series. Definitely Clockwork Angel by Cassandra Clare! I absolutely loved it! I really enjoyed Everfound and Shadow and Bone. Thanks for the awesome giveaway! I've read so many great books this year, it's hard to choose! I loved a lot of the Indie books I read. There are still a few books I'm waiting on that come out next month! Thank you for the giveaway! Aww so many good books this year! I really liked Froi of the Exiles and The Fault in Our Stars. I've read some great books this year, but I think I'd have to say Jennifer Estep's Widow's Web, since the Elemental Assassin series is my favorite series. It's so hard to choose! I've really, really, really loved Blue-Eyed Devil by Lisa Kleypas, City of Ghosts by Stacia Kane and Naked in Death by JD Robb. Thanks!! Mark of Athena by Rick Riordan!! My favourite this year has been The Fault in Our Stars by John Green. Nothing even comes close! My favourite book of 2012 was probably Insurgent. Wow. There's just so many! The Fault in Our Stars by John Green, The Book Thief by Markus Zusak (yes I finally read it), and Unraveling by Elizabeth Norris are definitely among the top! That's a hard question to answer. I have a few favorites. One of my favorites is "Shadow of Night" by: Deborah Harkness. And I just loved The Chemical Garden Series, "Wither" and "Fever". Thanks for the giveaway and that it's international. I've read so many great books this year, but what comes to mind most would be The Secret Keeper by Kate Morton and Brightest Kind of Darkness by P.T. Michelle. So far! I have a lot of favorite books for 2012. I love The Fault in Our Stars by John Green, Slammed and Point of Retreat by Colleen Hoover, and Onyx by JLA. I loved The End of Your Life Book Club! My fav book this year has been Beautiful Disaster. Poison Princess is my favourite so far! My favorite is And When She Was Good by Laura Lippman. Paper Towns by John Green was on of my favorites this year. The Syndicate by Shelena Shorts ! I really liked Rot & Ruin and Dust & Decay. Great series! just evil by vickie mckeehan, actually the entire evil trilogy. I can't pick just one favorite! Some of my faves were: Grave Mercy, Hemlock, Struck, The Raven Boys, and The Book of Blood and Shadow. Thanks for the giveaway! So many great books this year!! Some of my favorites have been Under the Never Sky, Beautiful Redemption, Unraveling, The Raven Boys, Pushing the Limits, My Life Next Door, For Darkness Shows the Stars, Wanderlove, Article 5, City of Lost Souls. My favorite book is Beautiful Disaster. . Some favourite(s) of 2012 for me: Please Ignore Vera Dietz, God is in the Pancakes, Blood Red Road, A Million Suns and Insurgent. Wow, there are way to many books to choose. Right now I'm reading The Mark of Athena by Rick Riordan. I've read a lot of good books this year, but my favorite book so far, has been Meant to Be. I have many favorite books....hhmmm, Reality Check by Karen Tuft. That is so tough! I have read so many amazing books this year. A few of my faves would be The Fault in Our Stars by John Green, Every Other Day by Jennifer Lynn Barnes, Timepiece by Myra McEntire, and Spell Bound by Rachel Hawkins. Grave Mercy by Robin LaFevers! I have so many favorites it's hard to pick. I'd say Dark Summer by Lizzy Ford or Darkness Falls by Jessica Sorensen. Most of my favorite books of 2012 are contemporary. They are Slammed, Point of Retreat and What I Didn't Say. For YA I'll have to say it's a tie between Sweet Evil and the entire Syrenka series (the last one is by Amber Garr and it is full of mermaids <3). And for adult I think my favorite so far would be Larissa Ione's Rogue Rider. My favorite book of 2012 is Starters by Lissa Pricce. Thanks for the AMAZING giveaway! Black City was my favorite! Thanks for this amazing giveaway - I would love to win! My favorite of 2012 is one of the first I read this year: Cinder. My favorite book this year is Onyx! My favorite books for 2012 were the Mistborn series by Brandon Sanderson. So amazing! I loved Of Poseidon by Anna Banks, it was fantastic! I loved Shadow and Bone! Seraphina is also a favorite! I really LOVED Easy by Tammara Webber! There was so many good books this year. I think probably Dearly Departed and Dearly Beloved. If I have to choose, then The Night Circus by Erin Morgenstern, because it was the most magical. Other top favs this year are: The Hallowed Ones by Laura Bickle, The Vanishing Game by Kate Kae Myers, I Am the Messenger by Markus Zusak, The Kingdom by Amanda Stevens, Seeds of Rebellion by Brandon Mull, etc. I highly recommend all of these! 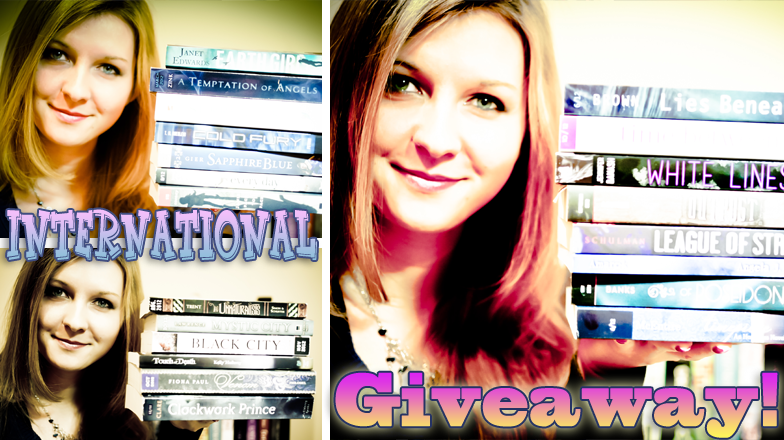 Insurgent by Veronica Roth is my favorite book of 2012 :) Thanks for this giveaway! There were a lot of great books this year, but if I had to mention just one, it would definitely be Shadow and Bone by Leigh Bardugo, really, really loved that one. The Book of Thief. However it's not published in 2012. I honestly haven't had just one favorite this year. There have been some stunning reads this year, so my fave's list has grown by a mile. One of them is Grave Mercy. Stunning in every way! Hemlock and a lot more others. Thank you for this giveaway! My favourite book of 2012 is definitely Abby Richard's Blackened Cottage!! I just got back into reading last month after almost 2 years of hibernation. The first book I read was Renegade and I loved it! It's my favorite for this year. Mark of Athena by Rick Riordan! My Life Next Door, Out of Sight Out of Time etc.. Loved Mistborn by Brandon Sanderson! My favorite book of 2012? BOY, THAT'S HARD. Um... I think I'd go with PANDEMONIUM by Lauren Oliver. I think I loved this one more than DELIRIUM! My favourite book 2012 would be Twenties Girl by Sophie Kinsella. My favorite 2012 so far is Midnight City by J. Barton Mitchell. I think I really enjoyed the Fallen Series this year! I Think my favorite book of 2012 is Hunger Games. Throne of Glass by Sarah J. Mass! What a triple awesome giveaway!!!! My favorite book that I read this year was hands down...Pushing The Limits by Katy McGarry. I could NOT put it down!! !